Can the parking lot be a tourist attraction? How do contemporary designers of urban spaces make sure that public buildings are not only functional but also interestingly designed? Where can we find the most interesting parking projects? In many city centers, open parking spaces have been almost entirely removed and replaced with Special zones and private parking lots resulting in competitive demand for every centimeter on the surrounding streets. Even spaces in nearby shopping malls are usually unavailable due to city parking demand. This all results in cities being required to build additional parking facilities within their existing structures which are usually historical and a difficult feat to accomplish in order to satisfy all parties needs in meeting demand whilst maintaining the historical beauty of the city. An example of this is a parking lot in Bydgoszcz, Poland, built in 2015 on the site of the city’s former defensive walls. After many consultations and negotiations, with many voices of opposition in the background, a building recalling Bydgoszcz’s old history was created. 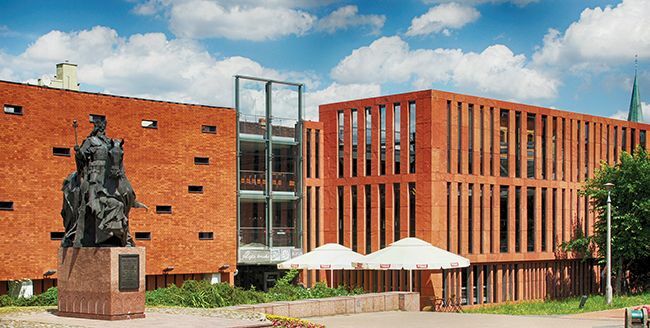 The front of the building has been slightly curved and has been designed primarily using of red bricks. However, it should be remembered that the invocation of old architecture is not always so obvious. In the 21st century, many cities focus on modern, intriguing buildings. Even near the city’s historical centre. Contrary to belief, parking has become one of the most interesting aspects of many cities and even a tourist draw, all you need is a good idea. And that’s what the owners of Peckham Rye Car Park in London had. They decided that in addition to using a parking facility purely for practical purposes they would also design it with art in mind. Installations, performances, exhibitions – all surrounded by parked cars. It turns out that this is not an obstacle at all. What’s more, the industrial climate perfectly harmonizes with art. There is even a bar on the terrace where all parking users (and art!) can spend time together. We can find many examples of interestingly arranged parking facilities, mainly those that are located in public facilities. 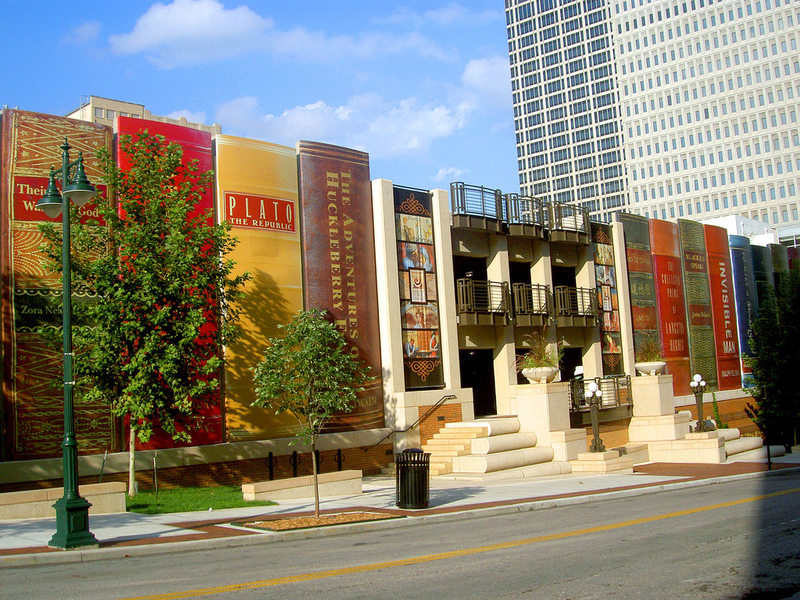 The example of the Public Library in Kansas City is given many times in this context. The front of its car park is designed like a book shelf. Walking down the street, we can see the backs of the most popular titles of the world, behind which cars are „hidden”. An interesting idea seems also to annex existing objects that have ceased to fulfill their original function. That’s how life was given to the Michigan Theater. Once – the place of artistic performances including David Bowie. Then a decaying ruin that became one of the sad symbols of the fall of Detroit. Although the Theater was erected at the beginning of the last century, it was designed on the model of sixteenth-century buildings. In order to save this stylized Renaissance building for a moment, a parking lot was arranged in it. Cars stand under painted domes and among not fully dilapidated pillars. To aid in the functionality and efficiency of the wonderfully designed parking spaces there are now systems being installed globally that not only extends the number of parking spaces but offers another depth to the design. 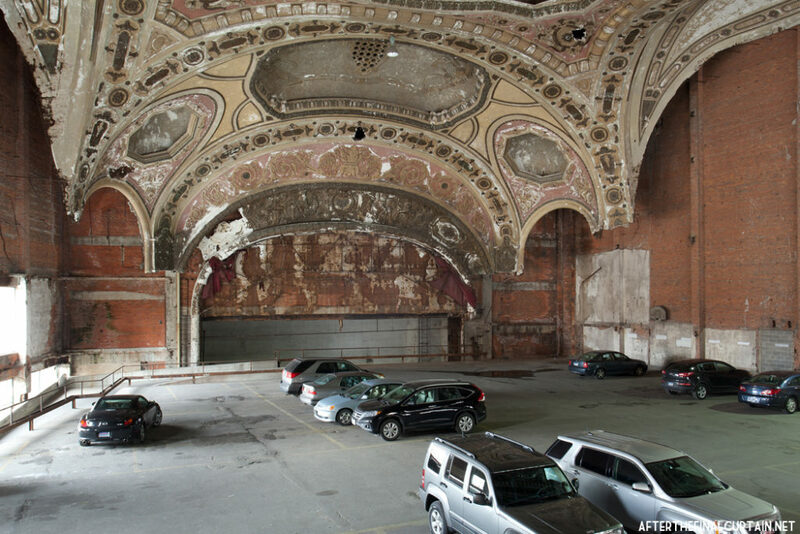 Parking at the Michingan Theater, author: Matt Lambros, source: https://afterthefinalcurtain.net/2013/04/30/the-michigan-theatre/MODULO Parking Systems is a prime example and could function effectively in any of the above solutions. Slope or Platforms work best in public buildings. These types of Parking Systems allow you to double the number of parked cars, and their entry and exit is not in any way dependent on others. Recently, these systems have been installed in one of Warsaw’s exclusive estates in Wilanów. We hope that other, interesting and bold projects, are also ahead of us!